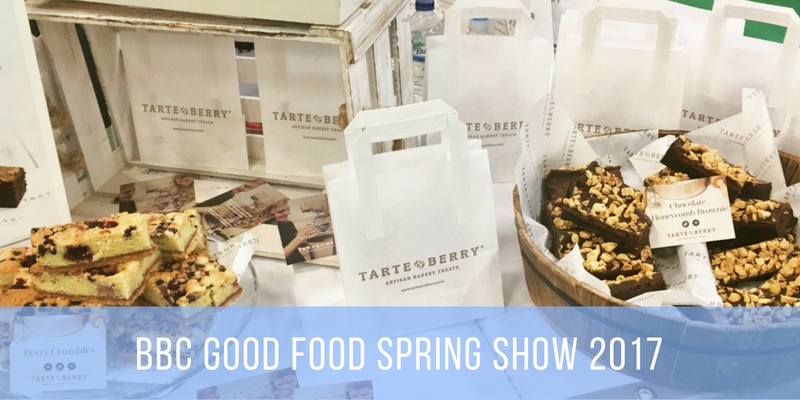 On Sunday me and my boyfriend headed to Harrogate to visit the BBC Good Food Spring Show. Whilst I'm not the biggest fan of cooking (it's a bit of a running joke that my repertoire consists of 3 dishes on rotation) I do love exploring new foods, so food festivals are right up my street! We visited on the final day of the show and before visiting we were a bit worried that the exhibitors may have started to sell out of products. However, we didn't find this to be a problem at all. The BBC Good Food Spring Show took place over three days, at the International Convention Centre in Harrogate. There were an extensive range of exhibitors at the show, spread across four themed shopping areas (Producer's Village, Drinks Cabinet,Deliciouslyyorkshire and BBC Good Food Champions), selling a variety of products from local produce to kitchen gadgets. There were also plenty of free samples to try (I think I could've got a little bit tipsy if I'd have had any more!) There was also a line up of chefs in attendance at various times across the weekend,Tom Kerridge,Lorraine Pascale and Antonio Carluccio, carrying out live food demonstrations, talks and book signings. The full list of guest chefs at the show can be found here and if you'd like to find out more about the exhibitors at the show you can find a full list here. 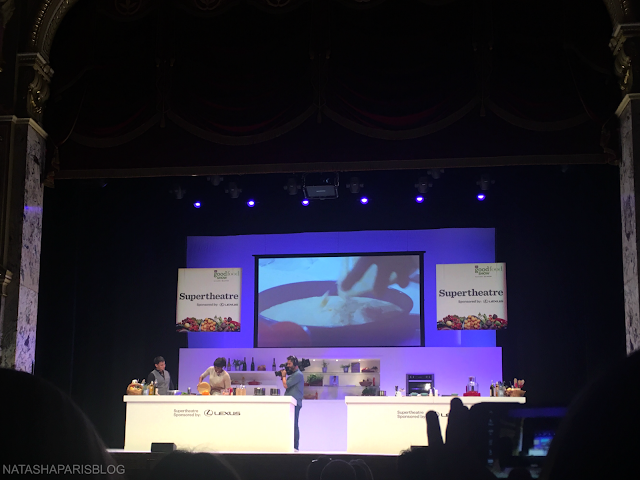 When we arrived we had a quick look around the show, before heading into the Super Theatre to watch a live cooking demonstration, from Lorraine Pascale. During the demonstration we watched Lorraine make a boiled orange, honey and lemon cake,which looked yummy, and refined sugar free raspberry and walnut brownies, which seemed that little bit too healthy for me but if you're into sugar free cooking/foods then they'd likely be right up your street. 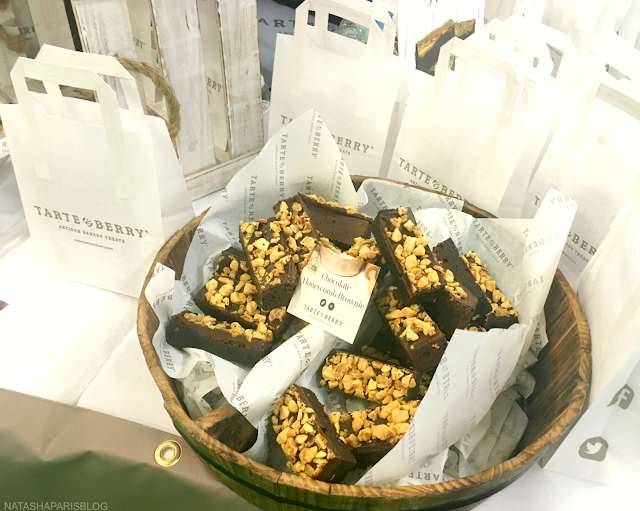 After watching the demonstration we spent a couple of hours wondering around the show, sampling a range of products from the many exhibitors on offer. I made a few purchases whilst at the show, my favourites being yummy brownies from Tarte and Berry (Salted Caramel Brownie for me, The Ultimate Chocolately Brownie for him), Yorkshire Haloum! with chilli flakes from Yorkshire Dama Cheese (which was a repurchase for me; the best haulloumi I've tried) and Oppo Mint Choc Swirl Ice Cream a guilt free ice cream which tasted delicious (I was a dubious at first but I'm pleased to admit that I was very pleasantly surprised).